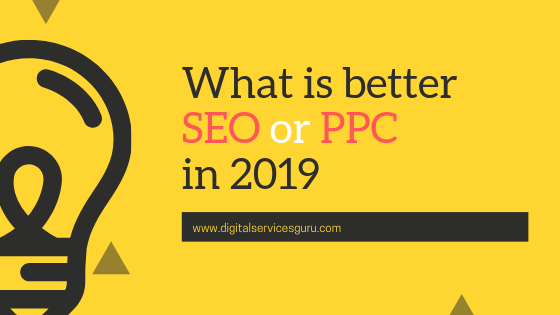 19 Mar What is better, SEO or PPC in 2019? The digital world presents you with various options for promoting your products. However, due to the availability of various choices, the marketers feel confusion in making their decision. Most of them have a common question- What would give us the higher ROI? SEO or PPC? You can find varied trends in the marketing world in every year. Thus, you may have a question on the effectiveness of both these methods. Your corporate needs and marketing objectives are two major factors to make the right choice for investment. However, to invest on any of them, you have to learn the details of SEO and PPC. SEO is a way to drive traffic or visitors to your site through the natural search process. You have to spend time and invest money to make your site friendly to the search engines. You can establish authoritative and relevant website. This marketing process comprises offsite and onsite SEO. The onsite SEO process is the activity of dealing with various elements of website. The search engine has to make out the content and structure of your site. By adding more data, you can increase the chance of getting higher position. Offsite SEO process is everything outside your website for having better domain authority. You have to work on the anchor list, backlinks and other factors. This is the paid technique to get visitors to your site. You have to pay when you get clicks of the visitors on your ads. It is also easy to reach your business site to the potential customers. You will get faster result by applying this technique. Social media ads- Post your ads on the social platforms to build relationship with the potential buyers. Search ads- This is a versatile option for you for better targeting. Video ads- These impressive ads also increase the rate of conversion. SEO takes several months to show the visible results from your effort. However, your PPC ads are instantly viewable, and you get faster outcome. SEO takes much time for building organic web traffic. You must have updated knowledge on the algorithms. You can easily set up your PPC account and display ads. In case of SEO, you have no control over the type of visitors, received by your website. You can adjust the PPC ads. Mobile SEO and local SEO have become more popular. The PPC marketers also target the mobile platforms to get better result. You will have higher ROI and CTR from SEO. However, by increasing your PPC budget, you will have more CTRs. Thus, the difference of two methods is tangible. You may have thought of choosing one of them for online marketing campaign. However, for the better result and more traffic, you can rely on both the methods.